January 6 2017. 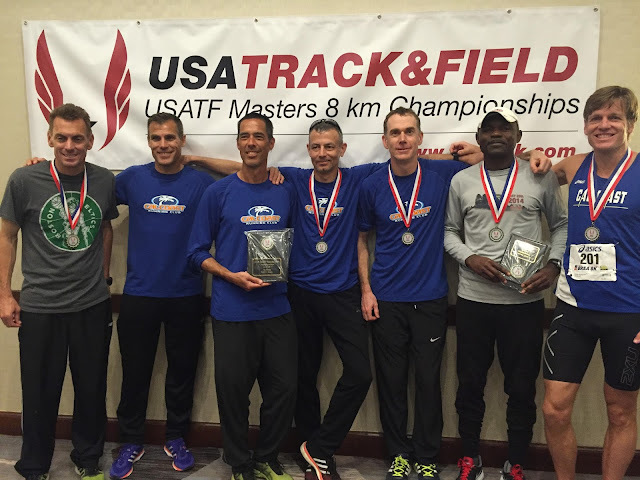 The 2016 USATF Masters Club Grand Prix was contested over nine events. There were 3 Cross Country Championships, the USATF (Individual) Cross Country Championships at Bend Oregon in early February, the Masters 5K XC Championships in Tallahassee Florida in mid-November and the Club Cross Country Championships in Tallahassee the 2nd weekend in December. The six Road Racing Championships included the 8K in Brea California in late February, the 10K in Dedham Massachusetts in late April, the Half Marathon in San Diego in early June, the 1 Mile Run I Flint Michigan in late August, the 5K in Syracuse New York in early October, and the 15K in Tulsa Oklahoma in late October. This year’s Women’s contests exhibited both change and continuity from 2015. Last year the Genesee Valley Harriers from the Rochester NY area took both the Women’s 40+ and 60+ and finished a close 2nd to the Athena Track Club (Southeast Pennsylvania) in the Women’s 50+. The outcome for the Women’s 50+ division was the same as last year. Athena won with wins at Flint and Syracuse, a 2nd at the 10K in Dedham and a 3rd at Club Cross to finish things off. GVH was only 20 points back as they took 2nd at the Masters 5K XC, a 3rd at Flint, and 5th place finishes at Dedham, Syracuse and Club XC. 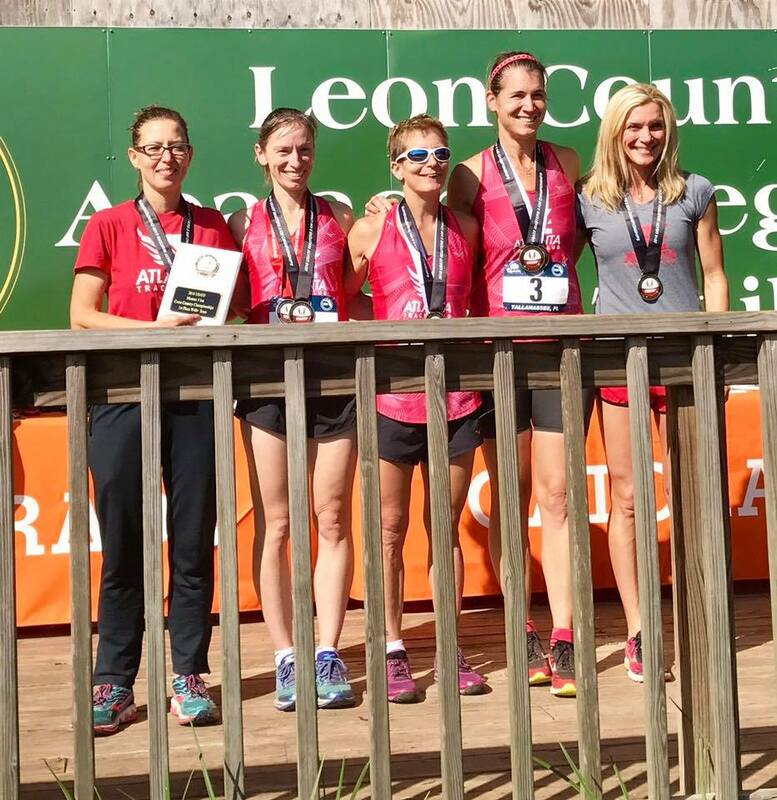 The Atlanta Track Club collected the 3rd podium spot with 3rd place finishes at Dedham, Syracuse and the Masters 5K XC, and a strong showing at Club XC. The New Balance Tampa Masters Racing Team was formed in the summer and came on strong in the autumn to take 4th place, only 10 points back from Atlanta. They won the Masters 5K XC and finished 2nd at both Syracuse and Club XC. They hope to shake things up next year with a full year’s worth of racing. There were new Champions in the W40+ and W60+ contests. GVH’s 40+ team had no wins this year. With the 12K cancelled, they also ran 1 less race this year. Atlanta fielded a very strong team when everyone was healthy. Despite challenges to the health and fitness of their top runners from time to time, Atlanta won the W40+ Grand Prix with 1st place finishes at Dedham, Syracuse, and the Masters 5K XC, and a 4th place finish at Club XC. GVH got a 2nd at Flint, and 3rds at Dedham, Syracuse and Club XC. Philadelphia’s TNT International finished 3rd in the Grand Prix with a 2nd at the Masters 5K XC, a 4th at Flint and strong showings at Dedham and Syracuse. Things were even tougher for the defending Champions in the Women’s 60+ division. GVH had so many injury problems they were not able to even field a W60+ team until late in the year. In their absence, the Impala Racing Team of the San Francisco Bay area and the Atlanta Track Club had quite a duel for the Grand Prix Championship. Impala Racing got off to a terrific start by taking first place in each of the first four events at Bend, Brea, Dedham and San Diego. It looked like they had the GP title with no contest. But then niggling injuries and/or other commitments started to get in the way and, at the same time, Atlanta started to find their way. After finishing 3rd to Impala’s 2nd at Dedham, they took the top spot while Impala finished 2nd at both Flint and Syracuse. That would be important if Atlanta were able to match Impala for points as they would have the tie-breaker in head-to-head competition. But it turned out not to be important; Impala put the Grand Prix away with a win at Tulsa; that gave them a perfect 500 points. Atlanta’s maximum possible points stood at 480. And in the final contest at Club XC the Impala team was able to defeat Atlanta so they definitely earned the GP win in every respect. Last year the winners of the Men’s 40+, 50+, 60+ and 70+ Grand Prix contests were Atlanta, Playmaker’s Elite/New Balance (Lansing MI), the Boulder Road Runners, and the Shore Athletic Club. Only one of those teams was able to repeat although they were all in the hunt and some got incredibly close to a repeat. Cal Coast got off to a great start in the 40+ with a 3rd place at Bend and a win at Brea. The Central Mass Striders with a 2nd and the Atlanta Track Club with a 3rd place finish got on the board at the 10K in Dedham. Cal Coast swept to victories at San Diego and Flint and nailed down the Grand Prix win with a victory at Tulsa. Even though Atlanta took 1st at Syracuse, it was too late. Even if they had won both XC events they would have come up 30 points short. In the event, they were not far off, winning the Masters 5K XC and finishing 4th at Club XC to nail down 2nd place. TNT International was in 3rd on the basis of a 2nd place finish at the Masters 5K XC, a 3rd at Flint and strong showings at Dedham and Syracuse. The Central Mass Striders only contested 3 events but that was enough for 4th place in the GP. 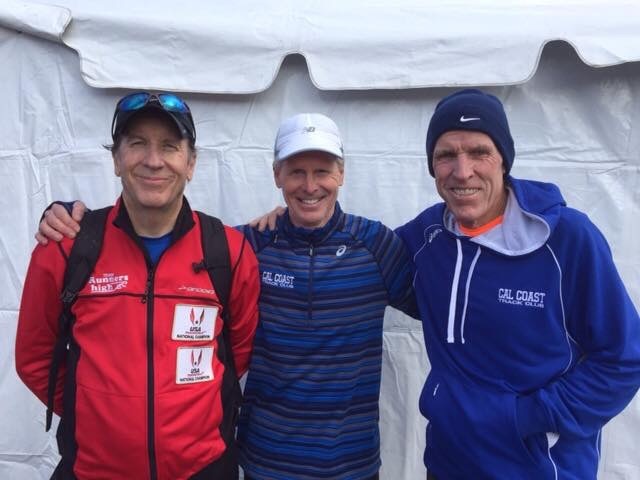 The Cal Coast 50’s team got off to an even better start with wins at Bend and Brea. None of their main rivals contested those races so they had a 200 point lead after the first 2 events! Things got a little more interesting when Cal Coast skipped the 10K race at Dedham but three of their rivals did not; the Greater Springfield Harriers grabbed the win, with GVH claiming 2nd and the Atlanta Track Club 5th. But Cal Coast was able to re-establish their lead by taking first in the Half Marathon in San Diego. The defending Club Grand Prix Champions, Playmakers Elite, made their debut at the 1 Mile Run in Flint Michigan, claiming first place and a hundred points. In order to defend they would have to contest all of the remaining events and win almost all. That was put to the test at the very next event, the 5K Championship at Syracuse. Greater Springfield took the win, giving them 200 points; they could win the Grand Prix if they could win the final 3 events of the year. Playmakers took 2nd and so kept their hopes (barely) alive. Cal Coast finished third, showing the first chink in their armor. But they could still hit 500 points if they won two more events; they were at 380 with all the others below 300. Neither Greater Springfield nor Playmakers contested the 15K at Tulsa. But Cal Coast did, taking the win and ensuring a Club Grand Prix first place. That gave them 480 points with two races to go. At the final event of the circuit, Greater Springfield showed they are a force to be reckoned with in the M50+ division, winning their 3rd event in as many tries. The start also went well for the Cal Coast 60’s team, which garnered wins in the first two events, Bend and Brea. But in their case, two of their rivals also scored some points; no 200 point lead for Cal Coast 60+! The Boulder Road Runners, defending Masters GP M60+ Champions, finished 2nd at Bend and 3rd at Brea. GVH picked up a 3rd at Bend. So after two events it was Cal Coast’s 200 to Boulder’s 170 to GVH’s 80. Boulder and GVH contested the 10K at Dedham, along with Ann Arbor, Atlanta and Shore, but Cal Coast did not. Boulder took the win with Shore 2nd and GVH 4th followed by Ann Arbor and Atlanta in 5th and 6th. Now Boulder had the lead, 270 to 200 to 150 ahead of Cal Coast and GVH respectively. Cal Coast got their lead back by being the only top 60+ team to contest the Half Marathon. Down by 30 points after San Diego, Boulder regained 20 points of their deficit by taking 1st to Cal Coast’s 2nd at both Syracuse and Tulsa. Boulder closed the last ten points with a 2nd place finish at the Masters 5K XC race. Cal Coast and GVH were tied at 480. Because the tie-breakers were all even, whichever team beat the other at Club XC, no matter where the finish, that team would win the GP. And GVH continued their late surge by winning that race and pulling to within 80 points of Cal Coast and Boulder and 110 points ahead of the 4th place Atlanta team. That meant no matter what happened at Club XC, GVH would be on the podium. The only uncertainty left for the M60+ division was whether it would be Cal Coast or Boulder on top. GVH took 1st, Cal Coast 3rd and Boulder 5th to close out the circuit. That left Cal Coast and Boulder tied with 480 points. Cal Coast took 1st in the Club GP by virtue of having 3 head-to-head wins over Boulder while Boulder had only two head-to-head wins over Cal Coast. It does not get much tighter than that! GVH got 3rd with 100 points to spare over the rest of the field, Atlanta, Ann Arbor, and Shore, in that order. In the 70+ division, Atlanta contested Bend and walked away with a 100 point lead. Shore AC, defending M70+ GP Champions , swung into action at Dedham, taking 2nd to Atlanta’s 3rd place. At the Half Marathon in San Diego, the Ann Arbor Track Club made their first appearance, finishing 2nd behind Shore. At the summer break, Shore led 190 to 180 to 90 over Atlanta and Ann Arbor. At the 1 Mile at Flint it was Shore, Atlanta and Ann Arbor 1-2-3. The same relative ordering prevailed at Syracuse except that it was 2-4-5 in the 5K. When Ann Arbor contested the 15K and brought home 100 GP points, that left it 380 for Shore, 340 for Atlanta, and 330 for Ann Arbor. At the Masters 5K XC it was again 1-2-3 for Shore, Atlanta, and Ann Arbor. That cinched the GP win for Shore. With 480 points heading into the last event, the Club XC Championship, Shore had an insurmountable lead and could stay at home and rest up for next year, knowing they had taken 1st place and defended their title. Atlanta had a 20 point lead over Ann Arbor so both teams had to contest the last event. If Ann Arbor finished 2nd or higher and Atlanta finished 4th or worse, then Ann Arbor would end up in 2nd with Atlanta 3rd; otherwise Atlanta took 2nd in the GP. Ann Arbor had a decent hope because, for the first time in 2016, their two top runners would toe the starting line. Two strong teams from the west Coast, Tamalpa Running and Florida West TC, would have prevented Ann Arbor from getting the 2nd place they needed even if both of those runners who started had been able to finish. Atlanta got 4th to Ann arbor’s 5th and rolled to 2nd place in the GP with their 20 point margin intact. *Won on the basis of a tie-breaker with more head-to-head wins over Boulder. Cal Coast M50+ Jeff Ambos, Dan Arsenault, Rob Arsenault, Rigo Chavez, Andy DiConti, Matt Ebiner, Ken Ernst, Rick Herr, Ray Knerr , Vince Lowder, Pete Magill, Dave Olds, Gus Quinonez, Michael Salzman, Thomas Schuman.